A quote by the Lifestyle Master Himself! Lifestyle is well represented by all the choices we make regarding our health. It starts from how well our body and cells function (a well adjusted spine), to the food we eat, to the activity we do, to the thoughts we have, and to the amount of sleep we get. 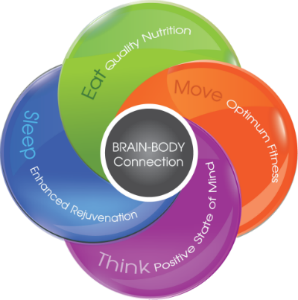 A healthy wellness lifestyle is well represented by all the choices we make to bring the body, mind, and spirit toward a state of balance (homeostasis), health and vitality! It’s really becoming the BEST VERSION OF OURSELVES. We, at the Grand Falls Chiropractic Wellness Centre want to inspire you and guide you through that journey. A healthy well aligned spine = healthy nerve system = healthy cells and body function. Clean eating is critical to our trillions of cells in our bodies. They take the vitamins and minerals from the food we eat. The statement, “we are what we eat” is so true. Our cells have so many functions in our bodies and aside from a healthy nerve supply from a well adjusted spine, they absolutely need good clean food. That is if you want to function at your maximum potential and have lots of energy for years to come! Be fit! The human body was designed to move. The “I” era (I-phone, I-pad, I-pod,) is having a tremendous negative impact on posture and overall health. People have only been moving their thumbs and that is certainly not enough! Research shows that the transition from desk stations to treadmill stations shows massive improvement in posture and health status. What’s the problem? People are too tired to move or have no time. That means priorities need to be re-organized. You can always find time if you plan on it. You only need a minimum of 30 minutes per day. The more you move, the more energy you will have to do more. Exercise will light you up! When you don’t feel like it, just think of the way you feel when you finish exercising and do it anyway! After a while you become addicted to being fit! 4. Think: Positive State of Mind! Meditating and clearing your mind of the busy rhythm of life is crucial to our emotional well being. It is important to take the time to thank the universe, meditate or visualize your goals before starting your day. Set up for a positive state of mind and you will be better grounded for challenges the day may present. Our lives occasionally present themselves with hardship where our state of mind is challenged to its maximum. It’s important to realize that those negative emotions may accumulate over time and cause health problems. It is also important to seek a psychotherapist, counselor or psychologist in order to deal with those negative emotions. These health professionals have specialized techniques to help unlock and unload the subconscious mind and free yourself of those emotional blockages. Did you know that your body’s cells repair and reproduce mostly when you sleep? Sleep is a must to our well being and healing. That is also why most people who are sick seem to always want to sleep! Scientists specify that sequences of NREM+REM sleep, optimize both physical and mental recuperation as well as memory consolidation. At the Grand Falls Chiropractic Wellness Centre, we are grateful for the opportunity to witness nature’s miracles and the privilege to serve others. Contact us today, so we can help you begin your journey to better health and wellness.